Pink is not going to let the flu stop her from singing the National Anthem at the Super Bowl. At least, she's hoping it won't. The singer, who is from Doylestown, Bucks County, and a Philadelphia Eagles fan, posted on Instagram that she is "trying to practice the flu away." Pink says since watching Whitney Houston perform the Anthem in 1991, it has been one of her dreams to sing the song. "And now my chance has finally come," Pink wrote. "I've arrived at another one of my dreams which is slowly becoming a sort of nightmare." Pink calls singing the National Anthem "one of the biggest honors" of her life. "...singing this song in front of my family, my military family, my dad and brother and step mama and family and the world. And the EAGLES!?!?! I promise I will do my best, as I always do," Pink wrote. She says though her two children got her into this mess, they can cough at her for the rest of their lives. 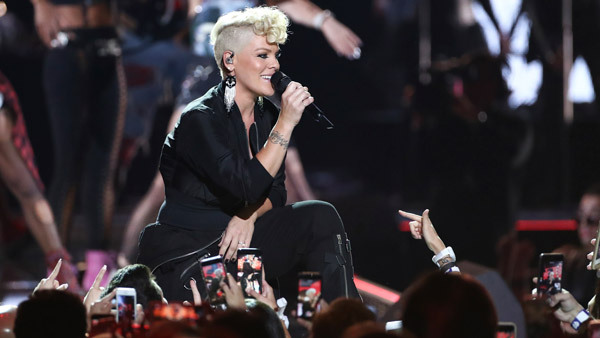 "If it's a contest, babies, you win," Pink wrote. She ended her message with a hashtag of "If I can sing, I'm going to kill it.